Este articulo se encuentra disponible en Castellano. For Latin America, 2017 has been a mediocre year economically, an intense year politically, and complex one socially, characterized by a growing wave of unmet demands and expectations from broad sectors of the middle class , corruption scandals, allegations of fraud, and conflictive re-elections. This combination of factors resulted in major social tensions and political turbulence that have made governability complex while eroding citizen support for and the legitimacy of numerous presidents throughout the region. The year has ended with sluggish growth, a regional average of just 1.2 per cent according to the IMF. This performance can be interpreted in two ways. It is good news because the region leaves behind two consecutive years of recession and six of a continuous slowdown. Yet at the same time it is bad news because this weak growth is not enough to respond to the growing expectations of the middle class, while at the same time endangering the important social gains made during the 2003-2013 period. Neither is it enough to reduce poverty quickly (indeed poverty and inequality are once again increasing) nor for creating the number of quality jobs the region needs: as ILO Regional Director José Manuel Salazar-Xirinachs has just warned, 2017 is the third year in a row in which unemployment rose in the region (from 7.9 per cent in 2016 to 8.4 per cent in 2017), with a total of 26.4 million people seeking employment but to no avail. 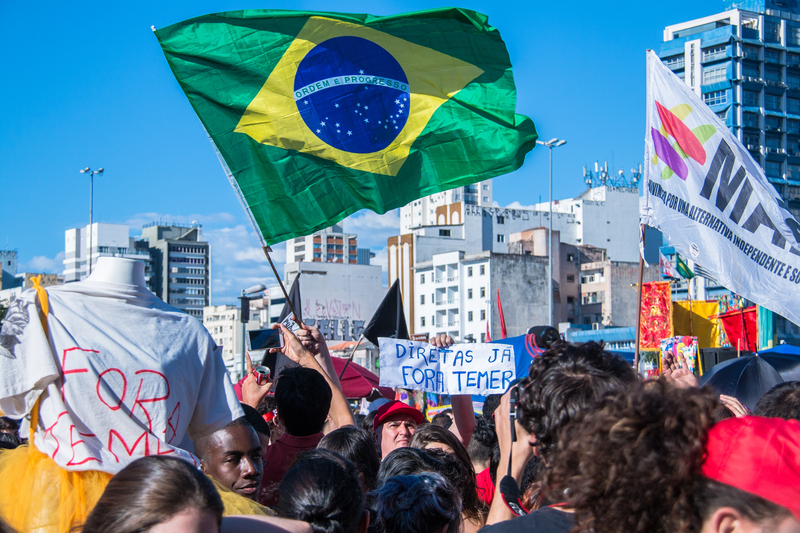 The news is also worrisome with respect to Latin America’s political culture: support for democracy saw a steep 9-point decline, from 67 per cent (in 2014) to 56 per cent (in 2017), according to data from the Latin American Public Opinion Project. This growing skepticism was accompanied by major dissatisfaction with democracy and a low level of trust in elections and the main institutions of representative democracy generally, and the political parties, particularly. The presidential elections in Ecuador, Chile, and Honduras represented the kick-off to mark the start of one of the most important electoral marathons in recent decades: A total of 15 presidential elections will take place in the region during the three-year period between 2017-2019. In two of the three elections held in 2017, the political forces in power emerged victorious: in Ecuador, pro-government candidate Lenín Moreno won (though he has since distanced himself from his predecessor Rafael Correa), while in Honduras, in a contested victory, President Juan Orlando Hernández was re-elected. In the third country (Chile) there was alternation in power: former President Sebastián Piñera is returning to La Moneda presidential palace in Santiago after four years in the opposition. In two of the three countries (Ecuador and Chile) a runoff election was needed to determine who would be elected president, and in two of the three elections (Ecuador and Honduras) the pro-government candidate won by a slim margin. In both cases the losing candidates alleged fraud, yet their protests did not lead to any further review or change in the outcome. The allegations of serious irregularities and fraud in the elections in Ecuador, and especially in the elections in Venezuela-for seats in the National Constituent Assembly, as well as regional and municipal elections, Nicaragua-municipal, and Honduras-general, cast light on the serious shortcomings that persist in the region in relation to electoral integrity; irregularities in the case of Honduras were denounced by the electoral observation missions of the European Union and the OAS. In the case of OEA, its Secretary General, Luis Almagro, even came to request the holding of new elections. The results in Chile and Honduras reinforce the change in the regional political trend from the center-left to the center-right, a transition that began in 2015 and 2016 with the victories of Macri in Argentina (revalidated in the midterm elections last October) and Kuczynski in Peru, yet within a persistent heterogeneity as evidenced by the triumph of the left, led by Lenín Moreno, in Ecuador. Re-election bids were the news not only in Chile (alternating) and Honduras (consecutive), but also in Paraguay and Bolivia, yet with different outcomes. Paraguayan President Horacio Cartes had to yield in his intention to continue in the wake of the political crisis unleashed by his re-election bid. In contrast, Bolivian President Evo Morales secured by a judgment of the Constitutional Court (under his control) what he had not been able to obtain in the 2016 referendum, i.e. the possibility of running for president in 2019 for a fourth consecutive term. In Ecuador, the conflict between President Moreno and former-President Correa, heightened by Moreno’s call for a referendum, to be held in February 2018, aimed at abolishing the pro-reelection reform approved during Correa’s third term, casts into doubt the future of reelection in Ecuador. If the proposal is adopted, it would block Correa’s possible return to the presidency in 2021. In Brazil, the epicenter of the Lava Jato (“Car Wash”) scandal and the Odebrecht case, President Michel Temer managed to survive allegations of corruption, and gave impetus to an ambitious agenda of structural reforms that has enabled Brazil to leave the recession behind. For the 2018 elections, Lula, despite his apparent links to several corruption cases, continues leading in the polls; his political future depends on what the justice system has to say in an appellate decision expected to be handed down in late January. It was the Odebrecht tsunami that impacted other countries as well. In Peru, Kuczynski was about to be impeached but managed to save himself by negotiating the pardon of Alberto Fujimori with a sector of the pro-Fujimori forces; this decision set off a serious political crisis that has yet to be resolved. And in Ecuador, Vice President Jorge Glas was convicted in first instance and sentenced to six years in prison for his ties with Odebrecht. And besides these Odebrecht-related scandals, there are other cases in the region: Chinese cement interests in Costa Rica, which are having a major impact in the election campaign heading into the February 2018 elections; the scandal that forced the resignation of Uruguayan Vice President Raúl Sendic; and the confrontation between Guatemalan President Jimmy Morales and the CICIG over a corruption case involving direct family members of the president. As the 2018 elections approach the implementation of the Peace Accords with the FARC has become ever more complex since the coalition that supported negotiations conducted by President Juan Manuel Santos has been dissolved. In effect, while the followers of former Vice President Germán Vargas Lleras have distanced themselves from the administration, the bloc critical of the peace accords—led by former presidents Uribe and Pastrana—has grown tighter and stronger. At the same time, in recent weeks the main coalitions that will compete in the 2018 elections have been taking shape. A novelty in this election will be the participation of the FARC as a political party; the Peace Accords themselves and the negotiations with the ELN will be among the key issues in the campaign. The rise of Donald Trump to the presidency of the United States on January 20 last year interrupted the policy of rapprochement between the United States and Cuba pursued by Obama in the last stage of his administration. This is happening at a key time for Cuba, when the economic reforms have continued to fail to show the expected results, and just as the Castro regime is approaching an unprecedented transition: Raúl Castro will step down as president in April 2018, though he will continue to hold onto the reins of power thanks to his control over the armed forces and the Communist Party. It will be the first time in six decades that the presidency of Cuba will be held by someone whose last name is not Castro. In Venezuela, the political, economic, and humanitarian crisis worsened, and the regime accentuated its authoritarian aspect. The clash between the opposition alliance (MUD) and the administration of Nicolás Maduro was resolved in favor of the president, who first brutally and bloodily repressed opposition protests and then illegally forced the election of a Constituent Assembly that stripped the National Assembly (with an anti-chavista majority) of its authority. At the same time, the regime, which continues to be prove incapable of responding to the serious economic situation and the humanitarian crisis, cornered the opposition—disqualifying and incarcerating its members, or forcing them into exile—which, weakened and divided, and given the lack of guarantees, did not compete in the most recent local elections. The dialogue between the government and the opposition has not produced any results as of year-end 2017 such as would allow for a political, electoral, and peaceful solution to the crisis. This article was originally published in Spanish in La Nación. The English translation was undertaken by International IDEA. Daniel Zovatto’s research and work focuses on the design, negotiation and supervision of technical assistance and political advisory programs in issues related to democratic governance and development, electoral reform, financing and internal democracy of political parties, strengthening of democratic institutions, and constitutional, political and electoral reforms. El Salvador will hold the first round of elections to elect a new president on 3 February, and on 10 March, the second round if necessary. Above, facilities of the system to capture and transmit the electoral results records. Image Credit: Supreme Electoral Tribunal of El Salvador.